I have had an opportunity to look a bit more closely at the Department of Homeland Security Cutter Fleet Study, “Options for the Future USCG Cutter Fleet Performance Trade-Offs with Fixed Acquisition Cost,” by Alarik Fritz • Raymond Gelhaus • Kent Nordstromr (.pdf). I highly recommend at least the synopsis, which is the first thirteen pages. I think the study is an honest attempt to determine the best mix for the Coast Guard fleet; it is quite well done. Basically it holds cost constant and looks at possible alternatives to build the most effective fleet possible. It builds on work done for the earlier Coast Guard Fleet mix studies, but unlike the CG studies, it looks at alternatives to the program of record. It looks at where the missions are being performed and considers the effects of weather on mission performance in four regions, the Northeast, Southeast, West, and Alaska. A major Cutter fleet of only NSCs and mod-270s does not meet the needs for heavy weather capability where it does exist. Because the Mod-270s have as large a crew as the OPCs, a larger number of ships would add to the operating cost of the fleet. We need ships with the capability to do boat and helicopter ops in State Five Seas particularly in the Northeast and Alaska. In the Southeast and West, where the primary missions are Drug Enforcement and Migrant Interdiction, we are a long way from a point of diminishing returns, that is, mission performance is most directly linked to the number of cutters, increasing in in almost direct proportion to the number available. The cutters ability to launch boats and helicopters in State Five conditions are much less important in the West and Southeast where most of the cutters are normally deployed. In simplistic terms, while we need some highly capable hulls, we also need even more hulls on patrol, but the additional hulls don’t need to be particularly sophisticated. This leads me to the conclusion to the we really need another option, another class of ship, I’ll call it “Cutter X.” Think of this new class as taking the crew and equipment of a Webber class Fast Response Cutter (FRC) and putting them in a larger hull with more endurance and seakeeping, while accepting lower top speed than the FRC. We can take advantage of the training and corporate experience with the FRCs, if we add similarly equipped larger cutters. while proceeding with the OPC program as currently planned. I’ll compare this possible fleet mix to the Coast Guard Fleet as it existed in 2000/2001 and the fleet in the Program of Record (POR). on the basis of cutter days available and crewing requirements using both conventional and augmented crewing. Before we do that, what would “Cutter X” look like? The design that I think comes closest to what I have in mind is the French built L’Adroit (also here and here). It is four times as large as the FRC at 1,450 tons but even with far less horsepower than the FRC (7,500 vs 11,600) it still does 21 knots. With the FRCs engines it would likely do about 24. It might be thought of as a modernized 210, in that unlike the 270 it has no medium caliber gun, fire control system, or ESM. I find L’Adroit particularly appealing because, not only is it simple and run by a small crew (30), it even has a hanger (cleverly sited under the bridge) designed to house and carry out the maintenance on both a 5-ton helicopter (like the H-65) and UAVs at the same time. The flight deck can accommodate helicopters up to 10-tons (H-60?). It is actually a bit more sophisticated than we need in the also has ESM and missile and torpedo decoy systems. Range is very good at 8,000 nautical miles at 12 knots. Seakeeping, thanks to modern design and stabilizer technology, is probably at least as good at 270s and probably better. As we have noted earlier, increased size doesn’t necessarily add much to the cost of a ships. Adding only volume, storage, and larger fuel and ballast tanks, I think these ships can be produced for no more than three times the price of the FRCs, perhaps less than twice as much. I don’t have prices for other examples, but for one, BAEs “Port of Spain” class, the original price for was only $80M each, less than twice the cost of a FRC and that figure included continued maintenance and training for the crew. This equates to approx. prices of: $700M/NSC, $350/OPC, $175M/Cutter X, and $60M/FRC. or 93 vessels including 44 “cruising cutters” to use the old generic term. or 91 vessels including 33 cruising cutters. or 89 vessels including 49 cruising cutters. The personnel allowance for new class could be as little as 30 but is likely going to be more, if only as an opportunity to provide more at sea experience. Using the assumed personnel allowances and the trade-off identified earlier, the proposed mix would require no more personnel than the program of record unless the personnel allowance for “Cutter X” is more than 46. At most the personnel allowance should not be more than that of the 210s. My figures may be out of date, but at least at one point that was a crew of 62. I’ll use this as the upper limit. The 2000/2001 fleet theoretically could have provided 8,140 cruising cutter days away from homeport (AFHP) (44 cruising cutters x 185 days) and would have required a total personnel allowance of 5,509. Without augmentation, the program of record would theoretically provide 6,105 cruising cutter days AFHP (33 cruising cutters x 185 days) and require a total personnel allowance of 4,526. With Augmentation (increasing their personnel allowance by a third and running the cruising cutters 230 days/year) the program of record would theoretically provide 7,590 cruising cutter days and require a total personnel allowance of 5259. Without augmentation, the proposed mix would theoretically provide 9,065 cruising cutter days AFHP (49 cruising cutters x 185 days) and require a total personnel allowance of between 4,188 (assuming a crew of only 30 for Cutter X) and 4,892 (assuming a crew of 62 for Cutter X). With Augmentation (increasing their personnel allowance by a third and running the cruising cutters 230 days/year) the proposed mix would theoretically provide 11270 cruising cutter days AFHP (49 cruising cutters x 230 days) and require a total personnel allowance of between 5264 (assuming a crew of only 30 for Cutter X) and 6203 (assuming a crew of 62 for Cutter X). What about the loss of FRCs? The proposal would trim 18 FRC from the POR. They are projected to operate up to 2500 hours per day. If we assumed that all 2500 hours were devoted to offshore cruising for the 18 additional units, that would add 1875 days AFHP to the POR for a total of 7,980 days AFHP for the un-augmented fleet and 9,465 days AFHP for the augmented POR. (disregarding the 40 additional FRC that are included in both proposals). It looks like this alternative provides an improvement of at least 13% over the program of record, possibly as much as 48.5% depending on how you view the FRCs as a patrol asset. It appears that the un-augmented version may be superior to the augmented version of the program of record while using far fewer people. Is it doable? What is the timing? How would it mess with other programs? Cutter X production could ramp up as FRC construction trails off. If we are unable to increase the FY2013 from the current two units, that will put the program at 20 units funded. With no NSCs planned for FY 2014 and 2015, hopefully there will be funding for six in FY2014. Out-years, beginning in FY2015 will require a new contract to complete the additional 14 units proposed. Assuming six units a year, in FY 2015 and 2016, the last two would be funded in FY2017. If the CG starts soon they could fund the prototype unit of Cutter X in FY2017. L’ Adroit was completed in approximately 13 months, so it is at least theoretically possible the first unit could be delivered well before the first OPC (expected FY2020). Replacing the FRC in the budget, two units a year could be funded in parallel with OPC construction. 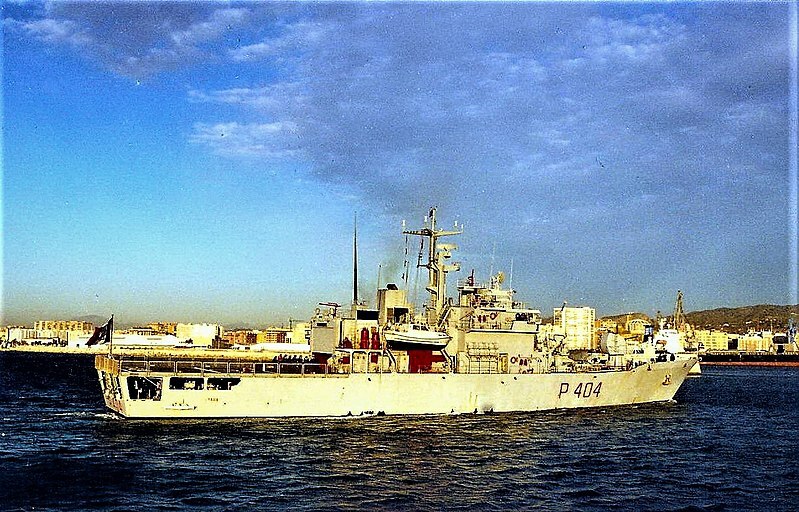 Cassiopea class (Italy), 262x39x12, 1,475 tons fl, 8,800 HP 21 knots, crew 60, endurance 35 days, 3300 nmi @ 17 knots (probably 5,000 at 12 or 13 knots) 76mm gun and FCS helo deck and hangar. This entry was posted in Shipbuilding and tagged Budget, FRC, nsc, OPC, shipbuilding by Chuck Hill. Bookmark the permalink. Oops, to open the link you need to copy it and paste it into a new window. It’s a pretty comprehensive PDF on the Protector OPV. This class certainly shows what can be done at a modest cost. I understand that the design gained weight and the ice belt is now lower than intended–still effective, but they cannot add any additional weight–that could be fixed. I really don’t like the fact that all its generator capacity is in a single compartment and that is separated from the engine room only by a single bulkhead. All these ships (even FRC) have an above-deck emergency genset, so the survivability of the main gensets isn’t as big of a deal IMHO… unless you need those gensets to power an emergency “get-me-home” propulsor. That brings us back to the real question: redundant propulsion, yes or no? 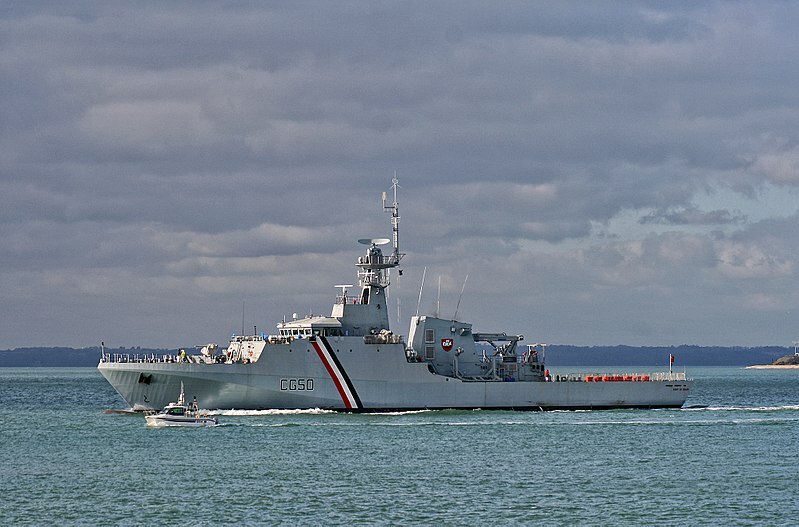 FRC and some of the larger foreign OPVs don’t have any redundancy. “Cutter X”, being more “offshore” than “oceanic,” should stick to the same barebones standard IMHO. I did not see the generator set. I also feel redundant propulsion on this class would be an unnecessary luxury, but if a drop down, trainable thruster were included, it would be a plus, and if the ship had that it could probably get along on a single main shaft or a better yet a single Azipod. Good analysis, Chuck. I like this low-end “Cutter X” idea, especially as OPC has drifted into 378 territory… (usual story of requirements creep compounded by cuts to the NSC program, it seems). No surprise here, as I’m on the record as a fan of l’Adroit! Your cost estimate of 2-3 times FRC seems just about right… To add a datapoint, New Zealand’s 1,800t OPVs also cost ~3 times more than Australia’s 270t PBs (NZ$90m vs. AU$26m). Both built in the same timeframe and in the same country, so almost an apples-to-apples comparison. Therefore the cost differential between FRC and Cutter X should be somewhat less than 3x… since unlike the Kiwi OPVs, Cutter X would be built in a full production run. Also, FRC->Cutter X wouldn’t be quite as big of a jump in size as Armidale->Otago. It would be hard to get below a 60 person crew and still be able to simultaneously launch a helicopter, launch a boarding team, and man watch stations. Also, endurance isn’t just fuel, it includes manning fatigue. I do like the concept though, OE for the FRC is three times that of a WPB. The difference between the OE of a OPC and WMEC-210 would be even starker. Maybe another option to consider is building a full compliment of OPC’s but making most of them designed for domestic operations, i.e., 210’s don’t deploy out of hemisphere where as 270’s do. You could benefit from lower construction costs of the common hull but strip most of the high-end capability such as major caliber weapons, ASR, fire control radars. Instead limit to FP weapons like the MK38. This would allow for all missions but defense readiness. Declare a small number of the class as out of hemisphere deployment capable and give them the full NTNO suite (DoD CONOP would drive the specific number of the class with the enhanced capabilities). The added benefit is that you have a proven wartime design and enough ships to meet the current Navy force requirements. If the budget improves, missions change, or Navy requirements grow then a program similar to the recent WMEC MEP could allow a quick conversion process. As others have previously stated, this would look similar to the life of the 327’s. We could phase this in rather easily. One-for-one replacement of the 210’s with the domestic OPC would close the capability gap. This would allow the maturation of the Navy LCS and DDG-1000 programs, the artic fleet study, the easing of the budget issues, and a better understanding of international drivers. We continue to finalize the enhanced build, and at a certain point (probably about the time we are replacing the last WHEC’s, starting to replace 270’s and completing the FRC’s) we shift to the enhanced build. Otherwise we would build out the entire OPC fleet as domestic and convert some when we go back to upgrade the originals (there are always a bunch of mid production upgrades). When I originally started working on this concept, I was thinking of a more seaworthy ship (about 1,000 tons), but one without a helo capability with the expectation that it would work with land based air. That is still a possibility, and it would probably be a two FRC for one “cutter X” exchange or perhaps even better. Crew requirements would depend a lot on how much we expected to do flight ops. A lot of the foreign counterparts have crews of around 30, but I think they may not consider the boarding parties and those that perform aviation related evolutions part of the regular crew. Still accommodations for more than 60 are rare. Modern davits or the L’Adroit’s stern ramps can minimize the number of people required to do boat ops. A haul down system could minimize personnel requirements for flight ops and allow them in more severe weather, but the Coast Guard seems to have given up on that. If flight ops are to be rare, I think a crew of 30-35 is doable. If they are to be routine, without a haul down system, then yes, closer to 60, hence the range (30-62). The study seemed to indicate that “de-contenting” the OPC would not save a lot. It would apparently still cost more then the “mod-270” so would have and exchange rate of less than 4 for 3. I think we need to have a high-low mix so we can tailor the distribution to missions and the prevailing environment. That is the ice strengthened hull and seaworthiness of the OPCs is overkill for drug interdiction and illegal immigrant interdiction missions. Chuck, I like the concept of what you have described here, but I think there is an even better way forward. 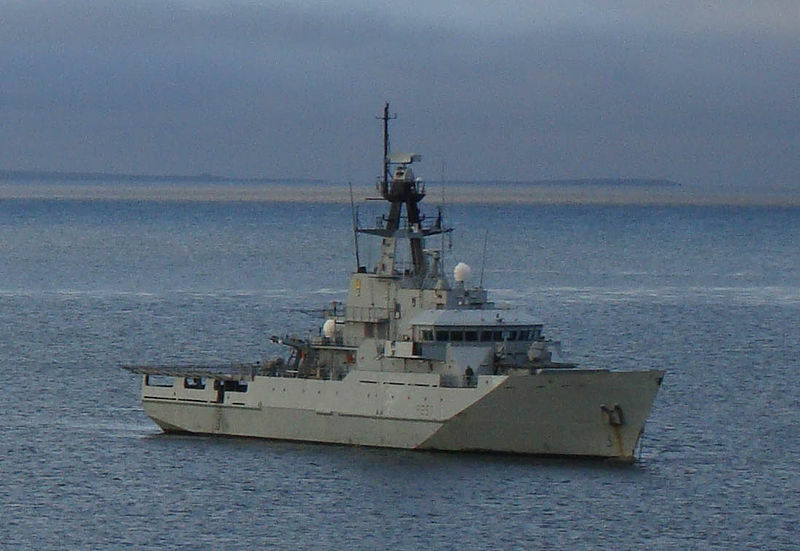 Three of the alternate vessels listed, the HMS Clyde, British River Class, and the Port of Spain Class are all derivatives of the of the Vosper Thornycraft (now BAE Systems Surface Fleet). The original thought on the River Class, according to VT, is to provide a ship accessible in cost effectiveness and realistically designed for the mission at hand. How this was done, was the original River Class ships where built to commercial standards, not military specifications, being the ships are offshore patrol and picket ships for the British Isles, they are not intended to be combat ships of the line. The Royal Navy then requested that VT upgrade the River Class with an ice reinforced hull, some military specifications, and a flight deck and hanger to act as a picket ship for the Falkland Islands. The Port of Spain vessels are other, further derivative vessels of the River Class, first designed for the Trinidad and Tobago Navy. I think where the USCG needs to look is a similar specification, if not the use of the same class. I think the USCG would get more capable and cost effective ships with taking a similar stand. We are a military service, and we are legally required to be able to defend the Coastal Defense Zones, but that being said, we don’t need ships that are ships of the line. We need picket ships capable of conducting SAR, LE and providing surveillance and harassment of any enemy vessels that enter the Costal Defense Zones while waiting for Navy Forces to arrive. The River Class could fulfill all of these roles. The Coast Guard could buy River Class hulls to use in the Caribbean and Eastern Pacific to use for SAR and Counter-Narcotics. The more reinforced Clyde class hulls be homeported in regions where they would be more likely to encounter ice. The savings would in the fact of not providing a second class of ships for ice operations, and using the same class and only reinforcing half the hulls for more northern operations. Most of these ships are built to something less than full warship standards. As long as it has the survivability features of the FRC, its large size will make it even more survivable. Certainly I’d pass on extreme quieting, shock hardening, “William” fittings, and wash-down systems. I think I’d leave the OPCs as the class to work in ice, but this class might be a good fit for replacing WPBs in Alaska. I’d also like to see one or more out in Guam (if we are not going to put something bigger there) because of the long distances. Very interesting post. The only problem with yet another analysis of what the CG really needs is that it is yet another analysis of what the CG needs, instead of actual ships being constructed in actual shipyards being actually commissioned. The CG is becoming an expert on ship analysis instead of constructing them. How about deciding on a 270/210 replacement and start building one – is that too much to ask? The question should be asked by Congress and answered by the Coast Guard: Why should the Coast Guard be awarded any funding for ships when their own incompetence at maintaining the ships they have (and also attempting to acquire new ones) has not been addressed. Until the Coast Guard demonstrates they are capable, they shouldn’t get a dime more of additional taxpayer money IMO. Most Coast Guard ships are more than forty years old and still going. They must doing somthing right! Obviously not considering it is their own mismanagement that has resulted in the forty year old ships still being in commission. The Navy has a 30 YEAR shipbuilding and END OF LIFECYCLE plans. You ask someone in the Coast Guard about those and they have no clue what you are talking about. It is their own fault they are riding around in old ships. BINGO!!! And that incompetence and pack of political will an courage extends to how ICGS and the contractors were and ARE being handled. ICGS had an “unconditional” performance guaranty in the Deepwater contract. That means they guaranteed the CG MISSION PERFORMANCE would be as the contract stated. In the VERY least it should not have degraded. ICGS owes for the 123s and the degradation of the MISSION capability of the CG. The CG should collect on this and then and ONLY then look for more taxpayer money. Why should the CoastGuard collect a dime Michael? What will they do with the money? Does the fishing fleet really care that there won’t be ships to harass them? Aviation and the small boat stations do all the Real SAR anyway. having served on 3 cutters and 1 squid ship i can tell you that the crews in general are going above and beyond in maintaining their rafts. the problems lie more with funds and the ages of the vessels. many are running at more then their recommended hours, which also causes maintenance headaches. anybody remember the 95’s and the problems they had near the ends of their lives, restricted sea states and at least one i heard of with a broken back. cutting crew size on newer vessels will also impact maintenance issues. i’d also like to add that i think that the upper echelon does not press the case for funding anywhere near hard enough, our responsibilties are expanding and our funding is lagging. i think the flag ranks need to take some classes from the navy and learn how to get down and dirty in the dc trenches, hell the navy got those piece o crap lcs’s which wouldn’t even make a passable cg cutter. stop bringing a nightstick to a 50 cal fight. Four words describe perfectly the reason why the Coast Guard is slowly becoming a maritime service with few seagoing assets – Integrated Coast Guard Systems. (and actually, you could further shorten it to one word – Deepwater.) That debacle was a mistake from the beginning, and is a big part of the reason Congress and OMB don’t trust the Coast Guard and their plans to recapitalize the cutter fleet. See my comment on the ICGS performance GUARANTY above. IMO, the “support” network for existing assets bares the blame as well. Economizing on maintenance has helped stretch dollars, but the fleet is now paying for it. Unfortunately our junior people are paying the price for the failure of leadership not only in the CG but also in the administration. The problem goes back to about FY87 when we stopped funding replacement MECs while retaining 205s and 213s built in WWII. As for “Deepwater,” back in 1991 when I retired, it seemed obvious to me that hiring the vendors to tell you what to buy was not a good idea, but it was happening throughout the Federal Government. Outsourcing was being pushed and it hurt the Navy just as it did the Coast Guard. In house design expertise was destroyed in both the Coast Guard and the Navy. It seems the Coast Guard has come a long way back in rebuilding their contracting organization. You do not see half the whining on Navy sites that we all see here about how their assets are decrepit though Chuck. It would be fair to say that the Coast Guard has hurt itself far worse. Their assets are not nearly as decrepit. there are a couple of reasons for the this. The Navy has a lot more political clout than the CG. The size of the Navy is a national issue, while the CG’s constituency is a lot smaller. In spite of this, the Navy has shrunk considerably over the last few decades. I remember when it was more than 20 times larger than the CG. Now it is only about eight times larger. This has allowed them to shed their older platforms. Their job has not increased in size as the CG’s has. I do agree the the CG can do a better job of presenting it’s case, and the Congressional Research Service has remarked on this. I’m preparing a post, contrasting the way the CG does it with the Navy does it. Maybe if the money would go to DHS the department would be interested in collecting. Rewarding the Coast Guard by getting money back it misappropriated will do nothing to solve the problem of its own inefficiency and organization. I agree with the points on the money being wasted if given to the senior leadership of the CG. That of course would have to be fixed. The Commandant clone good ole boy pipeline would have to be severed. Look at the Navy over the past 5 or so years weeding out the bad officers. The USCG needs a bit of that. Which specific “bad officers” need to be weeded out Michael? You obviously feel there are some. Please name them. What strikes me it that the current era of officer specialization in the Coast Guard today; this principle is not being extended to the cutters. The one-size fits all came into being during the late 19th-century, not from Service need, but from the desire to impress the Congress. The RCS wanted to impress the Congress into creating a retirement system for the officer corps by showing it was just as sound and proficient as the USN. There was the drive for some standardization, but this too was to make a national impression on those who criticized the Service for not being worth the money expended upon it. Remember, up to about 1880 the RCS had been self-supporting and did not receive annual appropriations from the Congress. The RCS had a collection of worn out vessels that were not built for the jobs they were doing. If a model for specialization is needed then look at the Alaska cutters from about 1880 onward. Each was built for that climate. Then again, they only sailed there from April to about October and then scooted back for a much needed refit. I realize that building cutters for specialized areas would be more expensive and reduce their use in other areas. However, the Coast Guard used fishing trawlers for some of the Greenland Patrol. It also sent 210s on Ice Patrol. Neither vessel type was suited for the task. That is the problem, as we see today the Coast Guard is not remotely as sound or proficient as the USN. Maybe he time has come to seperate the multiple civilian agencies that were combined to create the Coast Guard as a military service in the first place? imispgh and Patrick2 you are reaching your limit on repetitive comments that really offer nothing new. If you want to comment, please keep it succinct, and on topic. The same can be said about yourself Chuck. It’s his blog you goof. It’s funny you would say the USCG is so poorly prepared after all the naval incidences lately. The navy is smaller just like the USCG. The other branches have had massive program failures. I agree with Chuck in that our issue is marketing and clout. In addition, the Coast Guard does not have the military industrial complex muscle because of the size of our programs. That was why Admiral Loy and his crew developed the Deepwater project in hopes of getting noticed by industry. Thank you for allowing me t post on threads like this. I plan to honor the rules in doing so. If all you have to offer is name calling, I have nothing to say back to you except to please change your name to avoid tarnishing the rest of us simarly named. Patrick2, If you think being called a goof is name calling you surely could not have served long in the USCG. You forgot about respect you can be respectful to Chuck well disagreeing. I was simply trying to point out to you that it is his post. Along with that I do respond to your comment about the navy being better prepared. I feel like you are an alarmist with little to offer how to change it. You keep repeating the same comments again and again. Great fine, you presented your points. The Coast Guard like many agencies is facing a crisis of vision. The organization has mishandled the acquisition program for a number of reasons. The first I believe was because in the 1990 they the cut the staff in that division so badly they were ill prepared to handle such a large program. Admiral Loy, worked to get us back on the radar of the industrial complex, because they lobby congressmen. To make us more enticing they made a huge package of vessels and aircraft updates. It failed like I said because it was beyond the scope of the USCG to handle such a big upgrade combined with the many theory changes after 9/11. The Coast Guard is a great organization but it is in massive transition. I hope they will make the necessary changes to ensure it last in the capacity the US needs it to serve. The Deepwater debacles were not caused by the program being to big for the USCG. Yes it is large but there were no real technology challenges. The issues occurred because ICGS screwed the USCG who rolled over and took it. That simple. Each and every issue was foretold and/or avoidable. 123 hulls and electronic issues – foretold by ELC and given plenty of heads up by others. Easy to avoid – except for the fraud caused by Bollinger when they design the hull weak on purpose to save money on steal. But that has an easy fix too. Hold them accountable. All together this caused most of the massive delay and $$$ problems we see now. The overall fix? Hold ICGS accountable for the mission degradation by using the performance guaranty in the contract. ICGS was paid to be in charge as the LSI and had contractual and guaranteed responsibility to take the USCG mission specs and ensure they could be realized. At the very least they should not have been degraded. Keep posting imispgh. Many of the kool aid drinkers here don’t want to face the truth, but that does not mean you shouldn’t stop saying it. I walk a fine line though. I have been booted from every other site and would really like to not be booted from this one. I carry on in spite of our losing the appeal for the same reason I started this trek years before even knowing what a False Claims Act suit was. I feel that the men and women of th CG and the country deserve much better. No one is perfect and the solution will never be perfect. However there can never be even an acceptable solution without the INTENT to do the right thing. The USCG leadership and industry has never had even remotely adequate intent to to the right things. They all want the program guaranty to stay buried because it really is the solution. As these guarantees are very rare (as was the use of an LSI) the press and congress can’t get their heads wrapped around it which surely doesn’t help. At some point there will be a tragedy, someone will finally do their due diligence and the guaranty will be a big deal and a catalyst for change and to hold a lot of people accountable. You need to keep charging on Mike. Clearly nobody else in the Coast Guard cares, in fact from reading here, they oppose you. If not you, who will? Chuck, I agree with your idea of Cutter X. I do think our technology crept has gone out of control for our mission. The truth is the current format of cutters provides little defense in modern warfare. I think in the long run ridding ourselves of that mission and narrowing our focus would save us money. With some rework, the larger cutters might serve as second line ASW ships, but the most probable roles look like they will involve controlling the movement of merchant and fishing vessels.. Conducting inspections of ships as part of a blockade or something similar to Operation MarketTime off Vietnam, preventing smuggling. In a major war with a near peer like China, it would be enforcing a distant blockade to keep them from getting essential resources like fuel. With very few upgrades Cutter X could do that sort of thing. There were only two civilian agencies that were used to create the Coast Guard. The Revenue Cutter Service and the Life Saving Service. The LSS got in only because of political pressure and the drive for a retirement system for them. The first recipient of benefit was Sumner I. Kimball. Even then, the LSS was never completely merged. The word merged did not mean assimilation. The LSS was not fully assimilated until well after WWII. However, the culture remains. This is a reason that I contend there has never been a “One Coast Guard.” It is a cobbled group of varying interests. And getting back, the topic; these differences in culture and training cause conflicts in deciding what type of cutters it needs. We see the words, combined and merged when the 1915 Act is discussed. However, the congressional language of the era is better suited. The Coast Guard was legislated to exist “in lieu” of the two services. I do not believe the intent was to actually merge them into a “one” service and much of this has to be considered when defining a seagoing culture for vessel acquisition. It is odd that no one looks at culture as a consideration in making decisions. I was wondering what books that will give me a great peak into the history would you suggest? I have read most of what I can find on the book stories and some not so much. So it appears maybe the best stuff might be in article form since only a small fraction seem to in books. I am going off topic for a minute. Your question where to find comprehensive histories is a good one. With very few exceptions, they simply do not exist. The Coast Guard had never had a history program that puts an emphasis on its history. The emphasis is on public affairs. little new material or research. The Coast Guard promotes consensus history in that it has a consistent theme and method. You will find very little that diverges from the formula. Dennis Noble author who goes off the trail. The problem is finding a publisher. I’ve had three article rejected this year because the subject matter was considered too narrow for the readership or the topic would be of no interest to them. In addition, there are probably fewer than six academic historians who write about the Coast Guard. The rest write to the popular audience and spend no time in looking at the history critically. No one looks at how and why the Service is the way it is. Perhaps one day. sense that an outside source with and untried and untested ‘new’ technology was allowed to bamboozle the RCS into a class of vessels that did not work and were eventually turned into lightships. or sold. The history was ignored as not being relevant to the ‘current’ era. Also ignored were the twenty large cutters built between 1929 and 1939. How was this done in an era of such fiscal devastation? Bill– you really should look into the self-publishing service offered by Amazon. You can offer your work on Kindle or use thier print on demand services. You might even make some $$. Why should the public care about the Coast Guard when clearly by its own actions it does not care about its history then? More information on L’Aroit here: http://www.youtube.com/watch?v=sTQ_rgdhzxo&feature=player_embedded#! Wow, How’d I miss this great thread?!? I love the Cutter X idea, Chuck, especially for the Southeast/Gulf/Carribean and West coast areas. I also see the merit in shorting the FRCs slightly to get Cutter Xs to operate in the more-empty or longer-ranged areas of the Gulf or Carib.